Based on the UVS model, a resonated dual-core unisonal vortex of liquefied soil manifested on the Earth's crust, could vortically form a peculiar type of pit craters with dual-core markings. UVS predicates that a peculiar type of pit craters with dual-core markings were vortically formed by the manifested dual-core unisonal vortices of liquefied soil resonated on the Earth's crust. The cognitive paradox that negates to render the misconception of impact crater for a peculiar type of crater formed with dual-core markings, was thus meticulously resolved with its underlying structure and mechanism explicated. The grounding for its epistemic theories of truth: The underlying structure and mechanism of a peculiar type of crater as explicated with its hypothetical construct based on the UVS model, elucidated its delusional observations that render its misconceptions, mysteries, and anomalies. Thus, its cognitive paradox could be meticulously resolved, and all the related natural phenomena were then qualitatively analysed in the conceptual frameworks of UVS by inductive reasoning for explicating with their empirical evidence to predicate by abductive reasoning. In the UVS worldview, the causality for those celestial bodies in the observable universe that they are suspended spheroids, is they were formed by consolidation of vortically resonated stellar clouds while they are vortically suspended in their larger nested vortical system. In a vortically suspended condition, viscous matters in the stellar clouds were vortically consolidated as a spheroidal shape in a resonated dual-axis vortical spin fusion. Some planetary bodies became stratified on the surface, thus formed a crust layer. The dual axis vortical motion of Earth's nested polar vortex pair manifested underneath its crust layers, causes its viscous matter to bulge outward around the equator, and transformed Earth as a nested oblate spheroid; the Earth is fundamentally a nested dual-core torus structure. See the UVS topics on "The vortical universe model of UVS", "The structure of the observable universe", "The unisonal vortex mechanism", "The formation of stars and galaxies" for further elaborations on an underlying vortical mechanism of the universe that vortically forms and suspends all celestial objects. From the UVS perspective, when Earth is subjected to a significant torque-induced precession caused by the alignments of Solar System objects, it could harmonically spawn all sorts of dual-core vortex of liquefied crust. UVS predicates that a vortex of liquefied crust can be spawn on the Earth's crust as a result of precession effects caused by the alignments of Solar System objects. Evidently, the remnants of dual-core vortex eye manifested in such craters with a peculiar torus geometry of ring torus or spindle torus structures, suggest that these craters were formed by the vortices of liquefied crust that have had manifested on the Earth's crust. With a substantial torque-induced precession manifested on the Earth, it can cause a vortical gravitational singularity to spawn within the Earth with a strongly resonated torque-free precession. This energetic effect could vortically generate a low pressure system at a hypocenter just beneath the Earth's crust, which could manifest a dual-core vortex with the culminated vortical torsion force to form a dual-core crater on the Earth's crust with its effect of soil liquefaction. The above three craters as illustrated have the markings of a dual-core vortex, and as observed, one vortical core is at the top in all these images, and the other vortical core is at below. And evidently, there are many craters and basins on Earth that have the markings of a dual-core vortex. The diameter of this famous meteorite crater is 1.2 kilometers, and it is 49,000 years old. The markings of a dual-core vortex eye were visible at the center of this crater in Arizona. Click on image to see full size picture. See a close up shot for the crater center of this Barringer Meteor Crater, it shows the markings of a pair of large vortex eyes. Barringer Meteor Crater in Arizona. This meteorite impact crater is partly buried under wind blown sand. Its crater rim rises 25 meters (82 feet) above the land and the crater floor is 50 meters (164 feet) below the rim. The markings of a dual-core vortex eye were visible at the center of this crater in Australia. Wolfe Creek Crater in Australia. These craters in Canada were clearly visible for the markings of a dual-core vortex. Clearwater Lake twin impact craters. A geological study revealed the Mecatina structure in Quebec is in fact NOT a meteorite impact crater; rather, it is the result of multiple folding episodes of the bedrock. From the UVS perspective, the main vortex eye had formed as a circular lake, the secondary vortex eye on the right side of the main vortex eye can be seen in the image on right, had formed as an irregular lake within a circular indentation surrounding it; these remnants with vortical markings are evidence for a dual-core vortex eye that had manifested underneath the crust layer. Mecatina Meteor crater in Quebec. These submerged twin craters in Galapagos Island were clearly visible with markings of dual-core vortices. This is one of the Gemelos twin craters, which are a pair of craters approximately 30 meters deep located on either side of the road to Baltra. Comments: There are just too many meteorites being found near volcanoes and craters, these incidents might not be just mere coincident. Most of those iron-nickel alloy found probably were ejecta from Earth's outer core as a result of volcanic activities. Meteorite impact hazard is real, but it must not be mixed with craters that were caused by vortex of liquefied crust that occurred on the Earth's crust. From the UVS perspective, these dual-core craters are not impact craters. They were formed by the vortices of liquefied crust manifested on stratified surface of the Earth. By examine the satellite images of Earth closely, it could reveal countless big and small dual-core craters all over it stratified surfaces, and they are observable on landmasses as well as on sea beds. See an externally linked satellite image on "Crater Map" powered by Geology.com that could show Earth is marred with numerous craters in packs. These evidence with clearly visible dual-core vortical markings formed in the craters, are strong evidence for they were formed by vortices of liquefied crust that had spawned on the Earth's crust. All sorts of dual-core crater in Siberia. Watch a video clip on "Top 5 Largest Sinkholes Caught on Camera" that at 2:50 showed a huge pit crater that was recently formed in a town of Russia, a clearly visible dark dual-core marking could be observed in the bottom of the pit crater. Also, in a video footage of the B1 Yamal crater that features a sinkhole that was believed to be formed in Siberia on the 27th of September 2013, it could be observed that there were many overlapping big and small dual-core craters that have had formed around the outer rim of the apparently dual-core sinkhole, and as well as at the bottom of the sinkhole. The B1 Yamal crater was believed to be formed on 27th Sep 2017. The arrangement of Solar System objects on 27th Sep 2017. On the 27th of September 2013 in Siberia, the arrangement of Solar System objects was a T-junction crossed alignment of aligned Jupiter-Moon-Earth-Barycenter (of Saturn, Uranus, and Neptune), and this alignment was crossed aligned at almost 90 degree with the Sun-Earth alignment. From the UVS perspective, this crater could be vortically formed at a focal point of a tidal depression, which was caused by the tidal effect of the main alignment of Jupiter-Moon-Earth-Barycenter at its approximate 90 degree phase shift of its tidal bulges. The rotating Earth and the Sun with its tidal force acting on the tidal depression, could thus render the standing waves with significant vortical torsion forces generated in the tidal depression. With a possible soil liquefaction of the crust, the tilted rotating Earth could manifest a dual-core unisonal vortex cluster at that vortically susceptible location when the Moon moved into the alignment at the fateful moment. ~ With thanks to Michael Ngan for sharing with his post in FaceBook on a recently discovered Siberia sinkhole that was believed to be formed on the 27th September 2013. See the UVS topics on "The driver of earthquakes" that elaborates on how forced vortices of mantle sphere could trigger earthquake events, "Tunguska event" that illustrates on how a cratering event in Siberia could be vortically formed, and "The Great White Spot on Saturn" which elaborates on a vortical structure on Saturn that was observed to be formed periodically. See an externally linked topic on "Sun's location and neighborhood" that elaborates on the Sun is oscillating up and down relative to the galactic plane while it revolves around the Galactic Center, suggesting these oscillations often coincide with mass extinction periods on Earth. 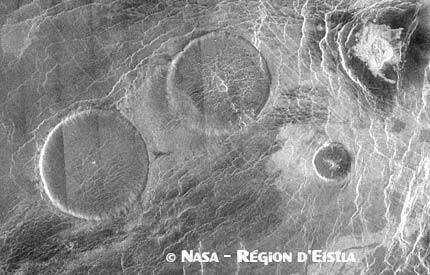 Based on unisonal vortex mechanism, Mars' Victoria crater was most likely caused by the resonation of a vortex of liquefied crust manifested on its stratified crust; a meteor impact would not be able to form those wave patterns and node markings at all. Watch a video on an experiment of acoustic sound waves that demonstrates how mechanical force of induced seismic waves could interact in a high viscosity medium. In the experiment with some interventions, mechanically resonated standing waves with excitations in the medium can be observed to manifest a dynamic cluster of wrapped surfaces that resembles pairs of splitting dual-core vortex. Heuristically, when a synergetic of torque-induced precession and torque-free precession occurs at a focal point in the force vortex of liquefied crust of the Earth, its could naturally generate such standing waves. See also video clips on "Acoustic water dance", "Cornstarch and vibrations", "Cornstarch at 35-55hz" and "WATER SOUND IMAGES". From the UVS perspective, apparently the node markings around the crater, were caused by a chain of satellite vortices generated around the circumference of the main vortex. These cyclonic satellite vortices impelled by the dominant vortex within the vortex eye, should thus cyclonically spin in the same direction as its dominant vortex. At the bottom and a bit to the right of the crater in the left picture below, the marking of a complete satellite vortex was still well preserved. Also, the inner circular pattern appears to be the markings left by the resonated satellite vortices that had spawned within the vortex eye. This Victoria crater on the southern hemisphere of Mars has a width of 750 meters, and its markings that demonstrated a slight twist, suggest its manifested vortex of liquefied crust was cyclonically rotating in clockwise direction. The above side view image of Victorial crater showed a radial pattern of spokes around the crater that are most probably the remnant of a chain of satellite vortices of a main vortex of liquefied crust that had shaped this crater. A chain of satellite vortices would have caused those arc shaped erosions (highlighted as white circle in right image) around the outer rim of the crater. Image on right highlighted those semi-circular node patterns, these erosions were formed by a chain of satellite vortices of a dominant unisonal vortex of liquefied crust in its external ring. At bottom right there is a circular erosion just outside the crater at five o'clock position, this is the remnant of a satellite vortex that has not collapsed into the main crater. Note: See the inserted graphic that illustrates vortical motion in 2D vectors, it shows the a possible vortical force interactions that could have caused the vortical patterns with nodes manifested within the inner round shape markings of Mars' Victoria crater. The parallel curved lines (cyan lines) are apparent the markings of the driving vortical current of a larger vortex of liquefied crust that had interacted with the progressive harmonic vortices (brown circles) dilated from the vortex center of this crater. See the UVS topics on "Unisonal vortex mechanism" that elaborates on the interactions of two vortical inertial forces that could spawn harmonic vortices and satellite vortices, and "Mammatus clouds" that elaborates on how similar vortical inteferrence patterns could be manifested on an atmospheric layer. An illustration for the unisonal vortex paradigm with nested vortex formations of cyclones and anti-cyclones. The animations are simple illustrations for the spinning motions of vortical fractals. Image above is a caption of Mars with several huge gaseous vortices occurred simultaneously. Click here for a close up image. If date of this event is known, the Solar System alignment for this simultaneous volcanic eruption with huge electromagnetic storms could be tracked. Image above shows a chain of volcanic craters at Northeast Pacific Ocean Ridge on Earth, a region known for its volcanic activities. These were very probably caused by vortices of liquefied crust that had spawned on the Earth's crust. Image above shows craters on Mars that are suppossedly caused by vortices of liquefied crust on its stratified surface. Take note of the crater with a raise pointed structure on bottom right in the half past four direction. The Yuty crater of Mars as shown, is known as rampart crater that has a raised outer rim and an uplifted tip in the middle of a sunken crater. The Earth's moon (@ longitude: 28°15'53" and latitude: 45°09'12"), also has a uplifted tip. The Lake Toba is the largest volcanic lake in the world on Earth, believed to be the site of a supervolcanic eruption, in its elongated form it apparently has a structure of uplifted tip similar to the Yuty crater of Mars. There are many "meteor craters" on Moon that also have such structure of cone-shaped uplifted tip in the middle of the craters. From the UVS perspective, a T-junction crossed alignment of significant celestial objects formed on Mars or Earth, could render a standing wave forcing on its crust layer from below with the effects of soil liquefaction. Vortically driven by a tilted rotating planet with torsion force acting on the tidal effect of mantle sphere formed at underneath the liquefied crust, it could drive the formation of a rampart crater at a manifested tidal bulge. Heuristically, these complex craters with uplifted tips could be tidally formed by the forced vortices of liquefied crust, and these craters could be vortically formed by the transferred motions from their vortices of liquefied crust with a horn torus geometry. From the UVS perspective, these enormous size polar basins on Mars as shown in the above images, were most probably caused by manifested polar vortices of liquefied crust on Mars. And the dune fields in Argyre Planitia of Planum Australe and Vasitias Borealis, apparently are markings of interference pattern rendered by vortices of liquefied crust that have had manifested on the crust of Mars. Jupiter's moon Io was believed to have an ocean of magma beneath its icy stratified silicate crust. In a previously known huge volcanic eruption on Io, there were volcanic ejecta that have overcome the escape velocity of Io, and this left a ring of icy slush mixed with silicate rock debris around Jupiter in its orbit. This is a thermal image polar vortex of Saturn, literally hundreds of storm clouds encircle the pole, appearing as dark spots in this infrared spectrometer thermal image, and each of these spots represents a storm. Based on unisonal vortex mechanism, these are the harmonic unisonal vortices. If a unisonal vortex of liquefied crust has occurred on the crust of a Solar System object (similar to the polar vortex of Saturn with harmonic vortices), it could cause big and small cluster of craters to form all over the surface on the crust layer, and this could be structurally similar to those craters that have had formed in Solar System objects as shown in the above images. Heuristically, these craters are the remnants caused by vortical motion of liquefied stuff, and they have had become stratified from their liquefied forms. From the UVS perspective, these are how those homogenous craters could have formed on the surfaces of these Solar System objects; these were effecs of vortical motion that have had manifested underneath their crust layer to vortically from craters in all sorts of torus geometry. See some vortex clusters in an animated image that shows vortices on Jupiter in an ocean of gaseous viscous matter, see also UVS subtopics on "The primeval Earth and its moon", and "The cometary craters and the creation of chemical elements in the comet" that elaborates on how cometary craters could be formed. Image of polar vortex of Saturn - Credits: NASA/JPL/Space Science Institute/University of Arizona.